General Benedict Arnold came to Ridgefield, Connecticut, in April of 1777 to fight the British who had landed at Compo Beach at Westport, Conn., and marched north to Danbury, where the Redcoats burned many homes and community buildings. On their way back to the sea, the troops passed through Ridgefield where General Arnold and General David Wooster, leading local militia, attacked. Arnold's horse was shot out from under him on the Main Street of Ridgefield, but he continued to fight. Wooster was wounded along the North Salem Road (now Route 116). Wooster's son, protecting his father, refused to surrender and was run through with a sword, killing him instantly. General Wooster was taken to Danbury where he died a few days later, aged 66. 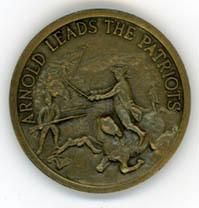 In 1977, the town of Ridgefield did a rather extraordinary thing: It issued silver and bronze medals commemorating General Benedict Arnold and his leadership at the Battle of Ridgefield. On one side, shown at left, the medal depicts General Arnold as his horse was being shot out from under him. The other side shows Generals Wooster and Arnold together. The medal was designed by Ridgefield artist Gail Glissmann. In 2002, for the 225th anniversary of the battle, the medal was restruck in bronze only. Professor James Kirby Martin, in Benedict Arnold, Revolutionary Hero: An American Warrior Reconsidered (New York University Press, 1997), devotes several pages to Arnold's participation in British General Tryon's raid on Danbury and the Battle of Ridgefield, using it to point out Arnold's bravery and strong leadership qualities, but also the lackluster support the patriot general got from the militia and citizenry of our part of Connecticut. The citizen-soldiers started to break and run. In desperation, America's Hannibal [Arnold] brandished his sword and rode back and forth, trying to form a rear guard to protect his fleeing column. Suddenly Arnold's horse collapsed. Having been hit by nine musket balls, the tortured animal, thrashing in death throes, had his rider pinned to the ground. An enemy soldier climbing off the ledge, rushed forward with bayoneted musket in hand. Supposedly he shouted, "Surrender! You are my prisoner!" "Not yet," was Arnold's alleged reply as he deftly retrieved a pistol from his saddle holster, took aim, and leveled his adversary with one shot. Freeing himself from the flailing horse, Arnold hobbled off toward a nearby swamp, with enemy musket balls flying all around him. His hairbreadth escape was a testament to what England's Annual Register of 1777 called his "usual intrepidity." A British officer on the scene conceded only that Arnold, like Wooster before him, had "opposed us with more obstinacy than skill," a statement of begrudging respect. Near where the battle involving Arnold took place, a century-old plaque marks the burial ground of "eight patriots who were laid in these grounds companioned by 16 British soldiers, living their enemies, dying their guests." For more on Ridgefield’s rich history, click here.